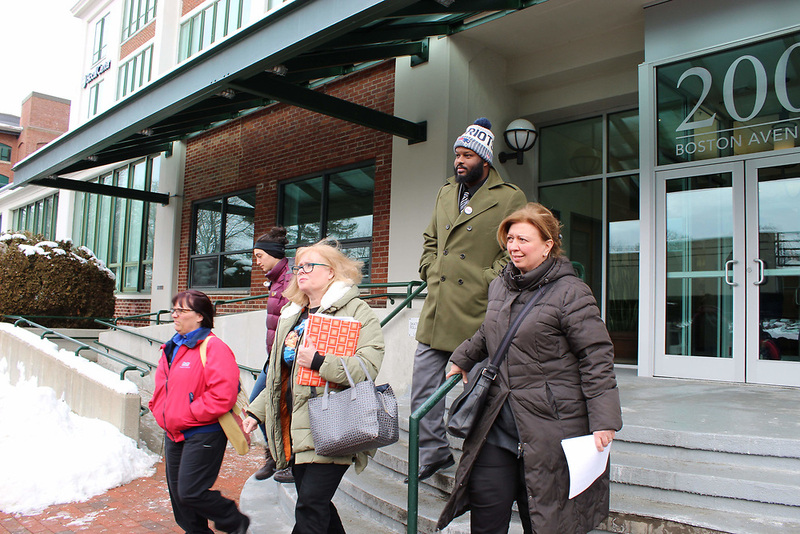 Representatives from Tufts and negotiators from UNITE HERE Local 26, the union that represents Tufts dining workers, met yesterday morning at 200 Boston Ave. for the 11th time since talks began in August. After four hours of discussion, an agreement on key issues such as wages and temporary contracts had yet to be reached, according to representatives from the union and the university. Michael Kramer, UNITE HERE Local 26’s lead negotiator, said that the university’s negotiating team, led by Joseph P. McConnell from the Boston legal firm Morgan, Brown & Joy LLP, had put forward a series of responses to proposals the union had made about non-economic issues including protections for immigrant workers. He said he felt that the union’s proposals were standard, but the university has yet to accept them. Patrick Collins, Tufts’ executive director of public relations, contended that the university has already agreed to “significant” job protections for employees and a grievance process, while it has proposed measures that would transfer the majority of workers on temporary contracts to full-time employment and give dining workers a pay raise. “While we have a ways to go to complete our work, we believe that both the university and the union teams are working conscientiously to seek to improve the working conditions of dining employees in a responsible manner,” Collins said in an email to the Daily. Kramer said that the points on which the parties have already agreed, such as the grievance process and jury duty, are often dealt with early in the process, and that the more contentious issues have yet to be addressed. One of those issues is wages. According to Kramer, in early December, the union proposed a system of uniform, collectively bargained pay raises to replace the current system of individual merit-based raises, which he said are subject to racial and gender bias. Kramer said that the university responded in mid-December by proposing that the current system be preserved. The university disputed this interpretation. Collins said that in their early December proposal, the university had included provisions addressing both wage rates and increases; when the union responded in mid-December, they addressed the increases only, and the union did not provide counter-proposals on wage rates until Jan. 18. The university is now reviewing those proposals, Collins explained. Collins also said that the union rejected a package proposal that would have addressed the issue of temporary contracts, making the majority of temporary employees regular employees with benefits and wage increases, at yesterday’s meeting. This was because the package had included provisions that were unacceptable to the union, according to Kramer. Lucson Aime, a first cook at the Dewick-MacPhie Dining Center who was present at the talks yesterday morning, said that the university’s negotiators are pursuing a strategy of delay in an effort to make the workers lose hope in the process. Kramer, who has been involved in dining workers’ contract negotiations at Harvard University and Northeastern University, also said that these talks have proceeded at a much slower pace than comparable ones, and that “significant distance” remains between the two parties. He stressed that the union is seeking a contract that is similar to those at comparable universities in the area, some of which are less wealthy than Tufts. “There’s no question of affordability. There’s a question of will and a question of whether the leadership of the Tufts administration has the will to correct what we regard as injustices,” Kramer said. Collins responded that the university recognizes the frustration that can come with negotiating an initial contract. “We appreciate our dining employees’ commitment to the bargaining process and … their candor. We hope that we will be able to reach agreement as soon as possible,” he said. William A. Herbert, a distinguished lecturer at Hunter College, City University of New York, who studies unionization at universities, said that the negotiations for initial contracts are often the most difficult because that contract becomes the starting point for all future negotiations. Failure to agree could result in a strike, he said. “Federal law requires that parties negotiate in good faith. It does not require that they reach an agreement,” Herbert wrote in an email to the Daily. Harvard University’s dining workers went on strike for 22 days in the fall of 2016 after their negotiations reached an impasse, according to an article in the Harvard Crimson. Tufts’ student activists, for their part, have tried in recent days to increase the pressure on the university. Christine Tringale, a night cook supervisor at Hodgdon Food-on-the-Run, said the group was determined to speed the process along. She said that both parties are looking to schedule further negotiations in March.